Gliders are basically light aircraft without engines. Most older types are made of wood and metal, modern ones are made from glass and carbon fibre. All are strong and controllable so pilots can fly them safely and accurately, normally landing within a few feet of the chosen place. They have long efficient wings and glide from 20 to 60 times as far as they descend. As the normal rate of descent is only about 150 feet a minute, any faster rising air can be used to gain height and prolong the flight. This is called soaring and in good conditions gliders can climb several thousand feet in each area of warm rising air or thermal and then glide several miles to the next one. In this way long cross country flights can be flown around pre-planned routes, usually finishing back at the starting point. 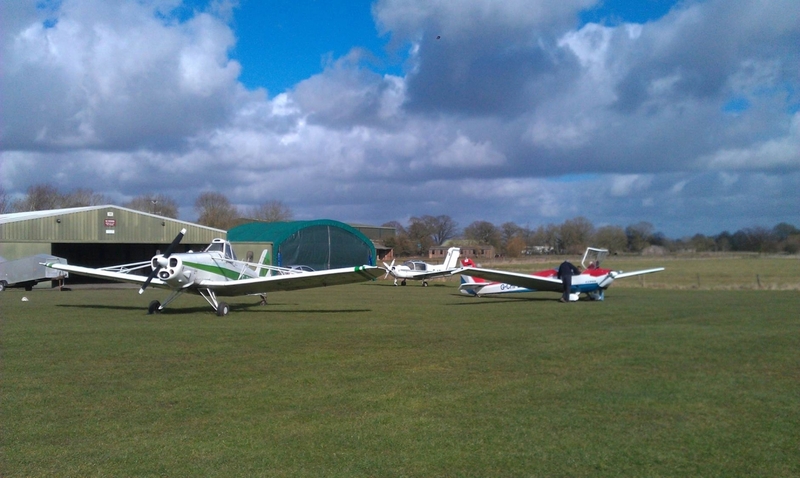 At Seighford gliders are normally launched by a winch placed at the far end of the field. This pulls in a 3000ft cable attached to the glider which then climbs, rather like a kite, to a height of 1000 – 2000ft depending of the direction and strength of the wind. The cable is released at the top of the launch and the glider begins a wide circuit of the airfield. If no rising air is found the flight will last about 5 minutes and the glider will land close to the starting point. As an alternative to the winch gliders are sometimes towed up behind a powerful light aircraft and released at a height of 2000ft or more. This is called aerotowing.